I had the pleasure of viewing these posters at the 2001 DeCordova Annual, featuring Ten New England Artists. I don't know if the artist has produced more of these, but its a fantastic interpretation of what Bollywood really is. The digital portfolio, Bollywood Satirized, is a critical commentary on the societal expectations that I experienced as a woman growing up in India. 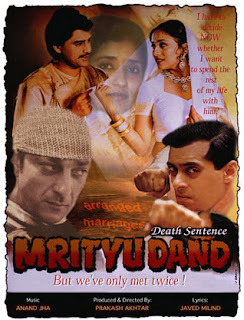 To create this work, I start with Indian movie posters, a reflection of the popular culture and the melodrama of Indian life. The visual and aural presence of cinema in India is the result of the largest commercial film industry in the world that produces close to one thousand movies a year. Most of the film industry is concentrated in Bombay, which is also called "Bollywood." 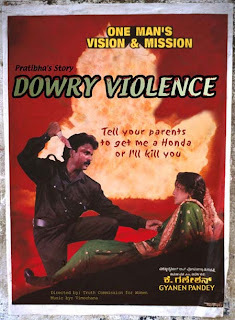 Using digital technology to alter the Indian movie posters, I re-interpret the images to make blatantly satirical commentary and humorously challenge traditional gender roles and behavior in Indian society based on my experiences. The final images include myself, other imagery and text from other sources. 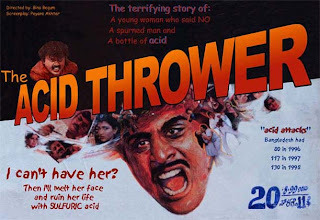 As Deborah Frizzell in NY Arts 2001 wrote "The sensual, seductive medium of mass produced Indian movie posters of banal musicals are manipulated to send messages about the construction of feminine and racial roles by a patriarchal society."